‘Data center modernization’ has held multiple definitions over the years, from simply reducing data center footprints and costs; to more revolutionary concepts, like the beginnings of virtualization. However, today’s version of modernization takes aim at a more impactful target – the business as a whole. 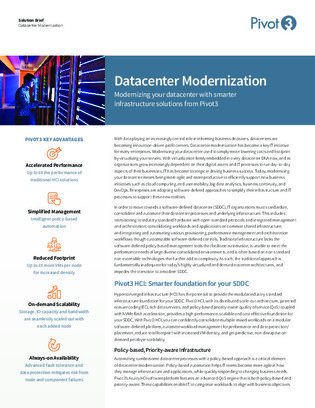 Inside, find out what today’s incarnation of data center modernization really looks like, and how technology like hyper-converged infrastructure (HCI) and software-defined data center (SDDC) architectures are supporting a more strategic approach to traditional on-premises options.